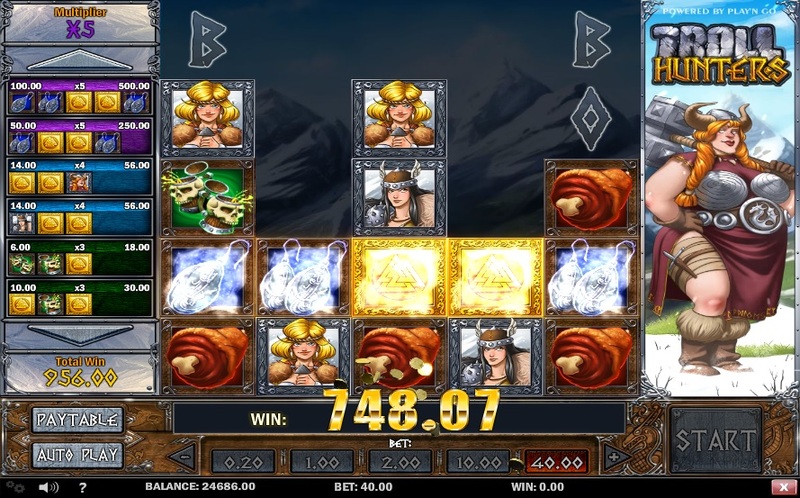 Troll Hunters is an awesome PlayNGo online video slot, based on the theme of Norse mythology. It comes with lucrative features such as free games, cascading symbols, and increasing multipliers. Since Troll Hunters is based on standard slots rules, it is very easy to play. The slot has 40 fixed paylines, but no coin value range to choose from. Instead, they have to choose from four fixed bets per game—$0.02, $1.00, $2.00, $10.00, and $40.00. Once they have placed their bets, they can click on the START button to set the reels spinning. If players prefer, they can use the Autoplay feature to play the game automatically for a specific number of spins. They can also turn the sound effects and ambience music on/off to avoid distraction. PlayNGo’s Troll Hunters slot is an entertaining and lucrative way to learn more about Norse mythology. The reels, which are full of icons of Norse warriors, a pair of large ear-rings, mugs of beer, golden runes, and joints of meat, are set against the backdrop of a snowstorm on snow-capped mountains. The introductory clip with its lively music starts the slot in a way that enhances its theme. Players are sure to have a great time while spinning the reels of this slot. In case of Troll Hunters, the symbols appear to drop from above. One of the most exciting features of this slot is its cascading symbols feature, which gets activated as soon as players create a winning combination. The symbols in the combination then disappear and new symbols fall into the spaces created from above, leading to more winning combinations and more wins. Whenever players activate the cascading symbols feature, the multiplier value increases by one. The Golden Runes wild symbol helps players finish winning combinations by substituting for all other symbols across the reels. If players land a combination of five Golden Runes along an active payline, they can win the top fixed jackpot of 100. However, this amount can be doubled by clearing the entire 5×5 grid the slot is made up of. The word BONUS appears at random behind any one or more columns. If players successfully clear the symbols on these columns so that the word becomes visible, the Troll Hunters Bonus Game gets activated and players will receive five or more free spins. During the free spins, they can win up to 20 extra free spins by hitting combinations of troll symbols. Payouts won during the free spins are multiplied by the number of symbols players had cleared to unlock the bonus game. Troll Hunters is worth playing not only for its awesome graphics and animations, but also for its potential for big wins. Players can find this slot at any online casino with PlayNGo slots.